Your doctor and other medical professionals will refer to the official guideline, which can be read online HERE. About how you can catch Lyme disease? The bacteria which cause Lyme disease are commonly caught from the bite of an infected tick. Lyme-infected ticks are found in grassy and wooded areas anywhere in the UK. Checking for ticks, and prompt, correct removal reduces the risk of infection, and using tick-focused repellents reduces the risk of being bitten. Most ticks do not carry Lyme disease. Lyme disease may theoretically be passed from a pregnant mother to the baby. No evidence was found showing Lyme disease can be spread by blood transfusions or sexual contact. This is a Lyme disease rash, called Erythema Migrans (or EM or target rash or bull’s eye rash). It usually starts where the tick bit, and expands outwards over several weeks. It is not usually itchy, painful or raised. It can first appear 3 days to 3 months after a tick bite. A rash does not appear on all people with Lyme disease, and it does not always look as distinctive as this. This rash is enough to prove Lyme disease, because no other illness causes this rash. Treatment should start and blood testing is not needed. Doctors should consider Lyme disease in people with several of the non-specific symptoms. “Non-specific” symptoms means symptoms that are found in many different illnesses. They include fever, swollen glands, headache, muscle pain, tiredness, difficulty concentrating (called “brain fog”), numbness or tingling and joint pains which may move around. Doctors should consider Lyme disease in people with symptoms in one or more parts of the body. Most of these symptoms can also be caused by other illnesses. Doctors should consider Lyme disease in people with a Lyme disease rash called Acrodermatitis Chronica Atrophicans (ACA), which appears on some people who have had Lyme disease untreated for years. Doctors should ask if a patient remembers a tick bite or has been in tick habitats such as grassy or wooded areas, but should not rule out Lyme disease if the patient cannot remember a tick bite. Doctors should make sure they consider other possible diagnoses, and only diagnose people who are ill.
One or two different blood tests are used. Under some circumstances, they may be done more than once. Doctors should use a combination of laboratory tests, a person’s relevant history and symptoms to make their diagnosis. Tests for Lyme disease can sometimes produce incorrect negative results or incorrect positive results. Tests can sometimes be negative if done too soon after a tick bite, because antibodies usually take several weeks to develop. Doctors can start treatment before receiving test results if they think Lyme disease is highly likely. They should bear in mind that prompt treatment for Lyme disease improves the likelihood of complete recovery. If the doctor believes the symptoms are more likely Lyme than any other illness, he/she can diagnose and treat Lyme disease even if the blood tests are negative. Lyme disease testing should only be carried out using validated tests at accredited laboratories. Diagnosis should not be made solely on the basis of non-NHS tests. If a patient has had a private Lyme test that was positive, the symptoms should be reviewed and the doctor can ask the National Reference Laboratory (which does Lyme disease tests) for advice, and/or order an NHS Lyme disease test. Lyme disease testing can give incorrect positive and incorrect negative results. This applies to all types of Lyme disease test, including the ones used by the NHS. The Lyme disease tests used by the NHS find antibodies to Lyme disease produced by the patient’s immune system, not the bacteria that cause Lyme disease. It can take several weeks for these antibodies to develop, so a test may be incorrectly negative if it is done too soon after getting Lyme disease. Tests can also be incorrectly negative in people with reduced immunity, for example people taking immune-suppressive medicines. Some Lyme disease symptoms need urgent treatment in hospital, for example if the heart, brain or eyes are affected. Doctors should follow the usual emergency procedures to deal with these symptoms, alongside starting antibiotic treatment. Children with Lyme disease should always be discussed with a specialist even if their symptoms do not need urgent treatment, unless their only symptom is a Lyme disease rash. Adults should be sent to a relevant specialist if they have symptoms severely affecting one body organ or system, for example a neurologist or a rheumatologist. The guideline contains separate tables of treatments for adults and children. The antibiotics which can be used are doxycycline, amoxicillin, azithromycin or ceftriaxone. These include safe options for pregnant women. The choice of antibiotic and the dosage depends, among other factors, on which parts of the body are affected. In most cases a course of antibiotics will last for 3 weeks but in some cases for 4 weeks. Doctors should help people deal with symptoms and other effects of Lyme disease appropriately, including other medications or practical support. Full treatment of pregnant women is very important. There are antibiotics to treat Lyme disease which are safe for unborn babies. There is not conclusive evidence on the probability of risk to the baby, but it is thought that the likelihood of a mother passing Lyme disease to her unborn baby is low. Having Lyme disease does not mean that you cannot get it again. Prompt correct treatment improves the chances of complete recovery. The guideline advises doctors to reassure their patients that most people who catch Lyme disease recover completely. For some patients, full recovery can take months or years after treatment. Some patients do not recover fully. These patients should continue seeing their doctor to monitor their symptoms and discuss ways to help them. These may include medications for chronic pain, difficulty sleeping, depression and anxiety. Patients may also need advice or support from their doctor in applying for disability benefits or other practical help. 1) Why doesn’t the guideline say whether Lyme disease can be spread sexually or by blood transfusions? The guideline does not make a statement about these possibilities because the answer is not known. No evidence was found showing if these theories are either true or untrue. 2) I have a Lyme disease rash but my doctor ordered a blood test anyway. Why? Doctors may order a blood test if they are not sure whether a rash is a Lyme disease rash or not. There are several other types of rashes that can have a similar circular shape to a Lyme disease rash. Also, the Lyme disease rash does not always take the distinctive “target” appearance. However, blood tests for Lyme disease are often incorrectly negative if done too soon after a tick bite, because the antibodies which the test looks for may not have had time to develop. This means the doctor has to make a judgement on whether to wait for test results, or treat immediately, bearing in mind that prompt treatment of Lyme disease increases the likelihood of patients making a complete recovery. 3) I have lots of symptoms and they are all listed as Lyme disease symptoms in the guideline. Why doesn’t my doctor believe I have Lyme disease? Nearly all Lyme disease symptoms can also be caused by other illnesses. The only Lyme disease symptoms not caused by other conditions are two types of rash. These are the Erythema Migrans (target rash or EM rash or bull’s eye rash) which appears in some people shortly after the tick bite, and Acrodermatitis Chronica Atrophicans (ACA), which appears on some people who have had Lyme disease untreated for many years. Your doctor will consider all your symptoms together and may want to check for other illnesses which have the same symptoms. 4) Why is it possible to diagnose Lyme disease without remembering a tick bite? A very large proportion of Lyme disease patients have no recollection of ever having seen a tick biting them. It is impossible to feel a tick biting. Ticks the size of a poppy seed can spread Lyme disease and are easily mistaken for a speck of dirt. Ticks may attach to parts of the body where they are not easily noticed. The tick is often long gone by the time symptoms of Lyme disease develop. 5) I had a positive Lyme disease test and I am still ill after taking antibiotics. Why is my doctor testing for other illnesses and won’t give me any more treatment for Lyme disease? Some people have antibodies to Lyme disease, and would get a positive test result, even though they do not have current Lyme disease and have never been ill with Lyme disease. It is thought that their immune system has successfully fended off the infection. This means that having a positive Lyme disease test does not necessarily prove that Lyme disease is causing the symptoms that you have. Because the antibiotics have not helped you, your doctor is now considering whether your symptoms could have a different cause. The symptoms of Lyme disease can be the same as the symptoms of some very serious illnesses so it is important for your sake that your doctor is investigating all the possibilities thoroughly. 6) How can my doctor tell whether the Lyme disease infection has gone if there’s no reliable test for it? There is no way to be certain whether a Lyme disease infection has been cleared from the body. There are some symptoms of illness that are caused by your immune system when it is fighting off an infection. Your doctor will look for these as clues which suggest the infection may still be present. This may help him make a decision on whether a second course of antibiotics is needed. They may include painful or swollen glands, fever, severe tiredness, headaches, all-over body aches and night sweats. There are some types of test for Lyme disease that may be able to find out if the bacteria are still present in specific parts of the body. They may require taking fluid from one of the joints, or from the spine, and they are far more complicated than a blood test. They are only useful in certain cases, and the doctor will make a decision on whether or not to do these tests based on the patient’s symptoms. These decisions need to be made by experts, which is why the guideline recommends that GPs discuss such patients with the National Reference Laboratory and/or a relevant consultant. 7) Why doesn’t the guideline say anything about chronic Lyme disease? The guideline states that some people suffer “ongoing symptoms” and/or “permanent damage from infection”. 8) Why does the guideline offer no treatment for chronic Lyme disease? There is currently no proven cure for the ongoing symptoms that some people continue to suffer after one or two standard courses of antibiotics for Lyme disease. Some people have these symptoms because body tissues, such as nerves or joints, have been damaged. These tissues heal slowly and there is no known treatment to help them heal faster. In some people they never fully heal. In some patients treatment may have failed, meaning the infection may still be present. There is not currently a reliable test to diagnose if this is the case. Even if we assume the infection is still present, there is no research proving which antibiotic, or at what dosage, can cure an infection that has survived two of the courses of antibiotics recommended in the guideline. 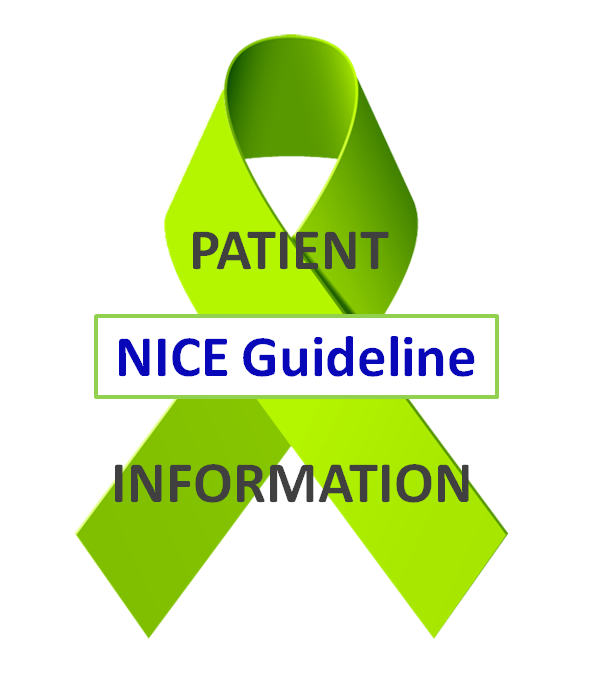 NICE guidelines are evidence-based, and a recommendation to use a treatment cannot be made if there is no research about that particular treatment. The guideline does recommend that doctors continue to monitor patients who do not recover fully, and offer them treatments to manage their symptoms where such treatments exist. 9) What evidence is there about the transmission of Lyme disease to unborn babies? 10) Why do some people recover completely while others do not? It is thought that the sooner people are correctly treated for Lyme disease after a tick bite, the better their chances are of making a full recovery. In published research about antibiotic trials, this seems to have been the case for slightly more than half of the patients involved. It is not known, however, what percentage of people who catch Lyme disease in the UK are in reality treated promptly enough to recover with no lasting effects. If you have a question about the guideline which is not already answered in the FAQ, please Contact us. The NICE guideline for Lyme disease is published – This blog post explains where the guideline differes from current practice and offers some explanations of the section about ongoing symptoms after treatment.